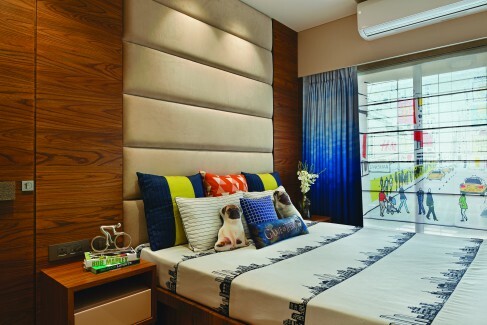 HS Desiigns’ recent and complete revamp of a home speaks of modern sophistication and vernacular charm in equal parts. The best part is that the stunning masterpiece of a home, even though eye-catching is decidedly understated. 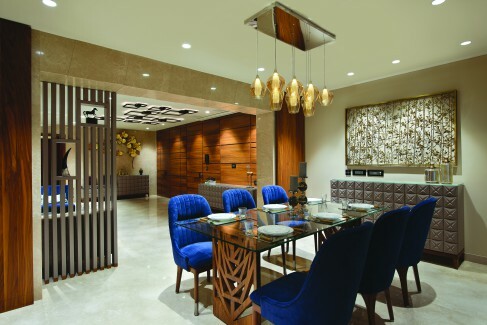 The intricate web-like detail carved out in teak creates accents of glamour by way of the center table and dining table; these are perfectly balanced by the surrounding areas of calm. 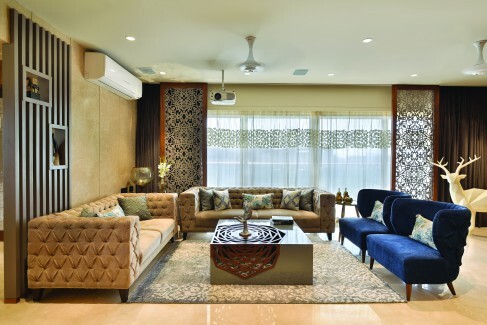 Nestled in a high-rise in Ghatkopar, in view of Mumbai’s skyline, an easy arm’s length from the shopaholics’ mecca of R City Mall and a stone’s throw away from the mayhem of the Mumbai Suburban Railway and Metro Station, HS Desiigns’ passion and flair find a new home in this lavish yet straightforward penthouse. 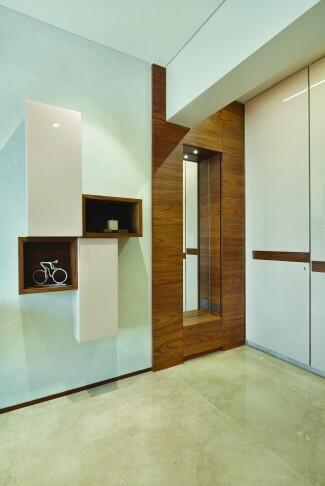 In the words of Architect Chinmay V. Asolkar, “The design of the entire apartment reflects urban elegance where the traditional and contemporary interact seamlessly. The home accommodates the needs of its inhabitants and also reflects their personality.” The predominant use of stone and solid wood gives rise to pure volumes that remain beautiful. The furniture in the house mainly draws its personality from polished, poly coated and upholstered surfaces. 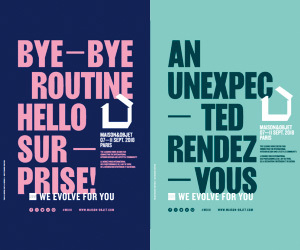 It seems that the goal here was mainly to play against type and celebrate certain inherent traits. Window treatments have not been overlooked. Chinmay says, “The curtains exude a feeling of personalisation which helps break the neutral scheme.” The sheers give the interiors a new heart in the form of a transparent layer of art that stands between the indoors and the outdoors. The son’s room emits a more playful vibe as ‘Game of Thrones’ cushions sit on the bed and an illustration of a busy street meanders into infinity on the hand painted sheer. “While the entire house is spread out on slabs of marble that speak a formal language, the daughter’s room rests on wooden flooring that brings in a little bit of old world charm,” informs Chinmay. Hints of scarlet used in the daughter’s room culminate in the soft furnishings that complete the room as a Gulmohar tree drapes the window. The son’s room emits a more playful vibe as ‘Game of Thrones’ cushions sit on the bed and an illustration of a busy street meanders into infinity on the hand painted sheer. Cappachino, sepia, concrete and shades of indigo – those are the kind of colours one sees when they’re in Mumbai. Synonymous with the sea, sand, memories and elite constructions that define the city, they’re muted, faded and more of a feeling than an actual colour. Walking right into these colours as one enters the apartment, you realize that they are subtle enough to never tire your eyes. The contrasts created by the friction of these shades create a kind of energy. The indigo on the dining chairs and winged sofas not only makes them stand out in the overall neutral palette but also adds a sense of freshness to the entire set-up as it transports you to a picture of fresh blueberries hanging off a branch. The intricate web-like detail carved out in teak creates moments of glamour by way of the center table and dining table that is balanced by surrounding elements of calm. In fact, the architect has cleverly played up the differences between one object and another creating all sorts of juxtapositions of rough and smooth, light and dark, rustic and refined. The Chesterfield English sofas clad in velvet inject warmth to the space that is wrapped by a discreet marble shell interspersed by simple, straight-lined, sleek wooden columns in grey PU and solid teak siding. French by religion, a Bonifant Balloon Chair sits quietly tucked in a cosy corner of the living room. It carries the room to another period adding a different sense of style and sophistication. Offsetting the wine clad piece of furniture, a snow white reindeer stands on guard beside it adding a wild note to the poise and elegance surrounding it. The indigo on the dining chairs and winged sofas not only makes them stand out in the overall neutral palette but also adds a sense of freshness to the entire set-up as it transports you to a place where fresh blueberries hang off branches. As much as one would find the presence of the beautiful animal sculpture surprising in a room that mixes the elegance of the English, French and Modern, it also injects a dose of excitement and makes the room come alive. A paint in a shade of white, which one could nickname ‘calm’ swathes the whole apartment as it serves as a canvas for bold, contemporary art. Leaves on canvas and in metal animate the walls. With display as the primary mission, lighting had to be spot on. Adjustable wall washers illuminate the paintings while decorative fixtures narrate a parallel story. It won’t be wrong to conclude that the interiors have a personal touch that renders the house its soul. The common thread that ties the different spaces together is bespoke design. The design team has not only rejuvenated a tired mid-century setup but also redeemed full points in making the penthouse look like a slice from today’s design pie.